I LOVE Greek Food I could eat it everyday no problem! I love that not only is it healthy but it tastes so fresh & flavourful. I was in heaven eating these, I was savouring each & every last bite & I can't wait to make them again. This is a quick & easy recipe with 10 minutes prep time, 2hrs to marinade & about 15 mins cooking time. In a bowl whisk together 1/4 cup olive oil, lemon juice, garlic, oregano, basil, thyme, coriander, season with salt & pepper. Dice your chicken & place into a big resealable bag, pour the olive oil mixture over the chicken, press the chicken into marinade. Seal bag & refrigerate for 2hrs. If using wooden skewers soak them in water 30 minutes beforehand. Preheat a grill over a medium-high heat. 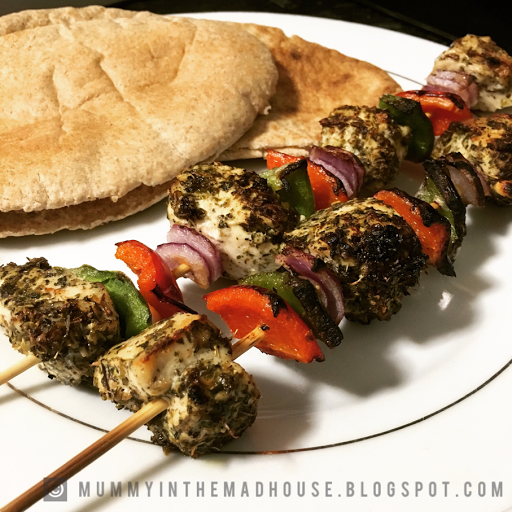 Thread your chicken & veggies, brush grill lightly with olive oil, place skewers on grill & grill for about 7 minutes each side. 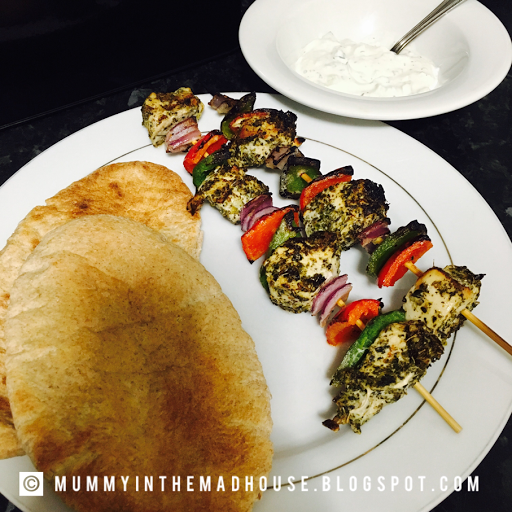 I served mine with Tzatziki Sauce & Wholemeal Pitta but you can serve them with what ever you like.